I have no idea how long my stirrup has been like this. Years, probably. I can’t remember the last time I messed with them. You guys are all out there buying fancy colored composite stirrups and yeah. Even now that I noticed it I can’t be bothered to fix it. It works fine. Too many other things to be neurotic about! I'm mostly amazed that it has stayed like that for so long. Secondarily amazed that it hasn't driven you totally nuts. Don't feel bad, mine is the same way, has been for YEARS. When I bought them (the pads), I didn't know stirrups came in different sizes! I have an old pair of stubben stirrup leathers that have split into 2, but they're so comfy I haven't replaced them. They're probably 15 years old now. Hey, if it works for you, I'm not judging. It is like a $10 fix tho if you're ever bored. I'm not a fancy stirrup girl either, whatever works man! 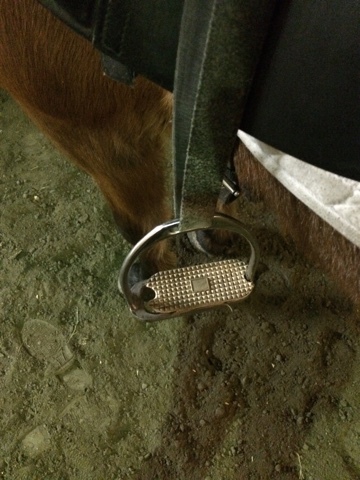 My stirrup pads are sooooo old on mine, trainer keeps nagging me to replace them I'm like ehh.